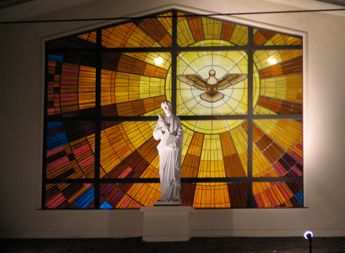 Stained glass is considered an important part of both religious and art history. For centuries, stained glass has played an important part in creating a spiritual environment in some of the world’s most historic religious institutions. Because of this we have partnered with Bovard Studios, one of the most respected organizations for the restoration and design of stained glass. Bovard Studios is a unique organization that specializes and excels in both the restoration and the design of stained glass. Bovard Studios’ commitment to high quality, unique stained glass has produced some of the most spectacular places of worship in the world. The pride of craftsmanship at Bovard can be seen in every project they restore or create—no detail is overlooked. For the past several years we have partnered with Bovard to help our clients with their stained glass needs. It is part of our commitment to provide full service to our clients. Click here to find out how Worship Interiors Group and Bovard can help with your stained glass needs.